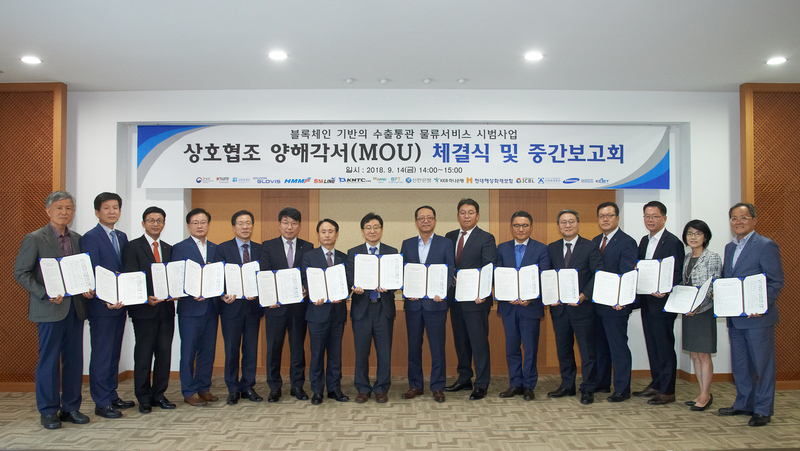 - Selected as blockchain-based customs clearance logistics service provider by Korea Customs Service; Concluded collaboration contract for the successful conduction of the business with 48 relevant government offices and companies. Samsung SDS (CEO: Won-Pyo Hong, www.samsungsds.com) announced that it will build the world's first blockchain-based 'export customs logistics service' using its own blockchain platform Nexledger™ under the supervision of the Korea Customs Service (KCS). KCS has concluded an agreement on the blockchain-based export customers and logistics service business with 48 relevant government offices and companies, including export-import public institutions, shipping and insurance firms. Through this agreement, KCS will establish customs clearance and export customs logistics services with private groups and will redesign business procedures. Meanwhile, there are plans to establish a cooperative system to respond jointly to changes in the industry. KCS selected Samsung SDS as its main business operator in July 2018. The export customs logistics service will allow export-related organizations and companies to quickly share documents that occur at each stage from customs declaration of exported goods to the final delivery process, and it fundamentally blocks forgery of documents. Last year, Samsung SDS demonstrated the innovation and stability of the Nexledger blockchain platform by promoting a consortium pilot project for blockchain-based shipping logistics with 38 public, private, and research institutions. Samsung SDS applies its blockchain platform Nexledger, which has real-time mass transaction processing and smart contract capabilities, and a management monitoring system, to various industries such as finance, manufacturing, logistics, and the public sector. "With the success of this project, we will strengthen our leadership in the blockchain-based logistics field and contribute to enhancing the competitiveness of national logistics," said Hyung-Tae Kim, executive vice president who leads the logistics business unit at Samsung SDS. Explore additional ways we can speed up your business with our Logistics Business Process Outsourcing (BPO) services.